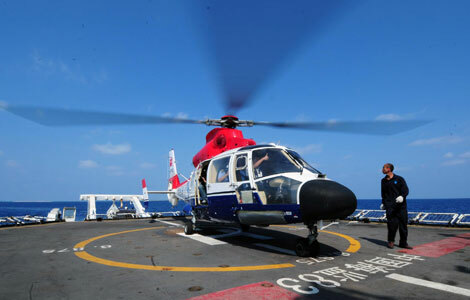 A China Marine Surveillance (CMS) detachment on Sunday started a joint ship-helicopter patrol of the Xisha Islands in the South China Sea. Three CMS ships — the Haijian 83, Haijian 262 and Haijian 263 — departed from the port of Sansha City at 9 am and will be joined by the Haijian B-7103 helicopter as they patrol the waters for nine days, said Zhang Weijian, the on-site director of the mission. The CMS ships are under the administration of the State Oceanic Administration. They have carried out regular patrols and law enforcement activities in waters under China’s jurisdiction since 2006.